Despite the warning of Abigail Adams, it would take well over a century for the "Rebelion" in which women ultimately would gain a measure of political equality with men. During the colonial period, most colonies followed the practice of tying the right to vote to the ownership of property which prevailed in Britain, where married women could not own land in their names; single women with their own property, usually widows or land obtained through inheritance from fathers in families without male siblings, would have property awarded by law to her new husband upon marriage. Men usually willed real estate to surviving sons, ensuring that land would pass from man to man, although personal property was often bequeathed to surviving daughters. As the colonies declared their independence, most of the new state constitutions they adopted expressly restricted the right to vote to males owning property, using terms like “freemen,” “free white men,” “male person,” and “man” in defining eligibility. In the few states where it was unclear, any ambiguity in defining the franchise was soon clarified to declare that voters were solely males. New Jersey was an exception. Its first constitution, hurriedly adopted two days before the signing of the Declaration of Independence, defined eligible voters as "all inhabitants of this colony, of full age, who are worth fifty pounds ... and have resided within the county ... for twelve months." While the vague term of "inhabitants" may have been inadvertent in its application to women, the state enacted election laws in 1790 and 1797 which expressly included women in the electorate by using the terms "his or hers" and "he and she" in referring to how ballots should be submitted. 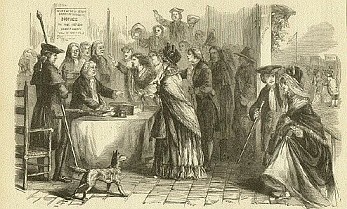 In 1807, however, following a local election in which it was alleged that women voters, and some men disguised as women, had turned out in force to influence the result of a local referendum on the location of a courthouse, the state legislature enacted a law clearly excluding women as voters. Nationally, the role of women in 19th century reform movements such as the abolition of slavery also evolved to spur efforts for their own electoral rights. Women wrote articles for abolitionist papers, circulated abolitionist pamphlets, and signed petitions to Congress calling for abolition. Others were active in harboring fugitive slaves on their way north on the Underground Railroad. In some cases, their presence provoked discrimination within the abolition movement itself. In 1840, the abolitionists Elizabeth Cady Stanton and Lucretia Mott attended the World Anti-Slavery Convention in London, but were denied seats on the floor by its organizers due to their gender. Mott and Stanton later emerged as key leaders of the first convention on women's rights which met in 1848 in Seneca Falls, New York. The reformers set their initial targets on the various barriers constraining women’s rights, including a lack of educational and economic opportunities in addition to the exclusion from an electoral role. Soon after the Seneca Falls meeting, Stanton and Susan B. Anthony, a Massachusetts teacher, began agitating for basic economic freedoms for women. Later, they unsuccessfully lobbied Congress to include women in the provisions of the 14th and 15th Amendments (extending citizenship rights and granting voting rights to freedmen, respectively). Suffrage leaders also adopted more aggressive tactics. In 1913, Alice Paul, a young Quaker activist from New Jersey who had experience in the British suffrage movement, formed the rival Congressional Union (later named the National Woman’s Party), which conducted mass rallies and marches to raise public awareness and support. President Wilson’s decision to lead the country into World War I further undermined the remaining opposition to allowing women to vote. 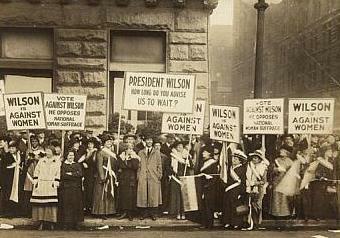 Wilson had preferred that suffrage be granted by the states, and had not supported a federal constitutional amendment. Suffrage activists argued that women's mobilization for the war effort as workers and volunteers outside the home would be more enthusiastically supported if they were recognized as equals in the political process. Alice Paul's confrontational style included picketing the White House for Wilson's reluctance to back a federal suffrage amendment, protests which initially were widely criticized as unpatriotic for diverting attention from the war effort. But when some protesters were arrested, the poor conditions and treatment they received in jail, which included force feeding after they began a hunger strike, greatly embarrassed Wilson, leading to his granting pardons to all who had been jailed. Legislative victories in key states also built pressure in Congress when in 1917 both Arkansas and New York granted partial and full voting rights, respectively. On January 10, 1918, the House of Representatives initially passed a voting rights amendment on January 10, 1918, but the Senate did not act before the end of the 65th Congress. It was not until after the war that the measure finally cleared Congress with the House again voting its approval by a wide margin on May 21, 1919, and the Senate concurring on June 14, 1919. A year later, on August 26, 1920, Tennessee became the 36th state to ratify the measure, thus approving the 19th Amendment providing full voting rights for women nationally.